Yesterday was my first proper Opening Day in Philly since 2006. It was also my son’s first ever Opening Day. The weather was gorgeous, but as every Phillie fan who saw yesterday’s game knows, this year’s team reeks. I’d use the modifier “offensive” to describe the team’s performance, but that would require the Phillies to have an offense in the first place. However, that doesn’t change the fact that this was easily the worst Opening Day I’ve experienced in all my years of following the Phillies. However, to be fair, it wasn’t as bad as the 1990 home opener (which was the team’s fourth game of the year) that I witnessed from the 700 level of The Vet, but that’s damning with faint praise. During the game, I kept trying to recall the starting lineup of the ’97 Phillies in an effort to compare the two teams. At a superficial level, the two clubs are fairly similar. They’re both incredibly bad clubs surrounding an ace pitcher (Schilling/Hamels) and one legitimate All-Star caliber starter (Rolen/Utley). However, the ’97 Schilling-Rolen combo will almost certainly prove to be better than than the ’15 Hamels-Utley combo. I plan on taking a closer look at the ’97 squad to get a better idea of how they compare. One position where I know the ’97 team exceeds the ’15 version: shortstop. Freddy Galvis may have a great glove, but Kevin Stocker was no slouch defensively. Furthermore, Stocker was actually competent with the bat. 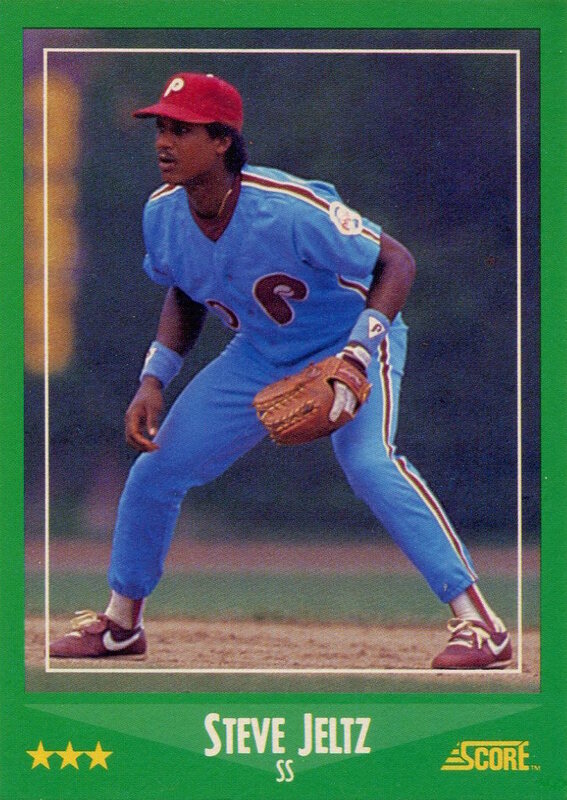 Galvis, on the other hand, appears to be the second coming of Steve Jeltz, sans the Jheri curl. I am still stunned that this team gave two of its outfielder jobs to Grady Sizemore and Jeff Francoeur. (I’ll let you decide which one of them is the better analog to Danny Tartabull.) I’m willing to wager money that both of them will be flat-out released–not traded, there won’t be any takers–by no later than the All-Star break. Seriously, I’d rather the Phillies play any outfielder in Lehigh Valley or Reading over these two. By picking Francoeur and Andres Blanco over Darin Ruf for pinch hitting opportunities, Ryne Sandberg seems intent on never giving Darin Ruf a chance to prove that he may be a late-bloomer in the Raul Ibanez mold. This is exactly the kind of squad that should be taking advantage of a situation like Ruf. Instead, we’re wasting at bats on those thirty-something impersonations of major leagers. Why were the Phillies wearing their red pinstripes yesterday and not their standard day game alternate cream uniforms? Did Odubel Herrera really anger someone in the Phillies front office or does he have the same problem as Chandler Bing when someone asks him to smile for a photo? In the profile picture displayed on the scoreboard while he’s at bat, he looks like he just smoked a massive amount of high-octane Guatemalan refer. 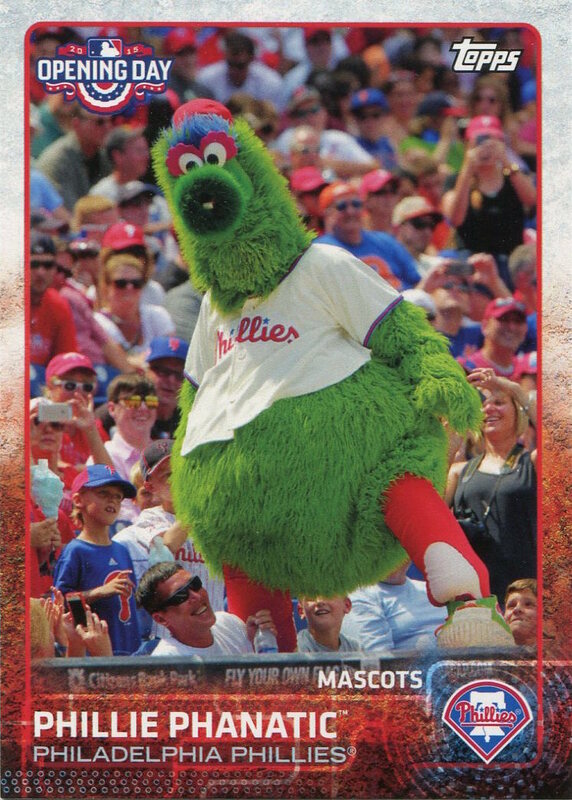 While this is nowhere near as bad as the photo the team used on Dave Wehrmeister’s sole Phillies card, it still looks comically bad. I also purchased both the Phillies Team Issue set and the 2o15 Topps Phillies Team Set while at the game. Although I have opened them both and took a quick look at them, I haven’t looked at them very closely. Truth be told, after the four-hour drive back home to Northern Virginia, I really wasn’t much in a mood to check out the contents last night, and today I made getting this post online a higher priority. I’m off to do that now and hope that they provide a better value than the product on the field yesterday. 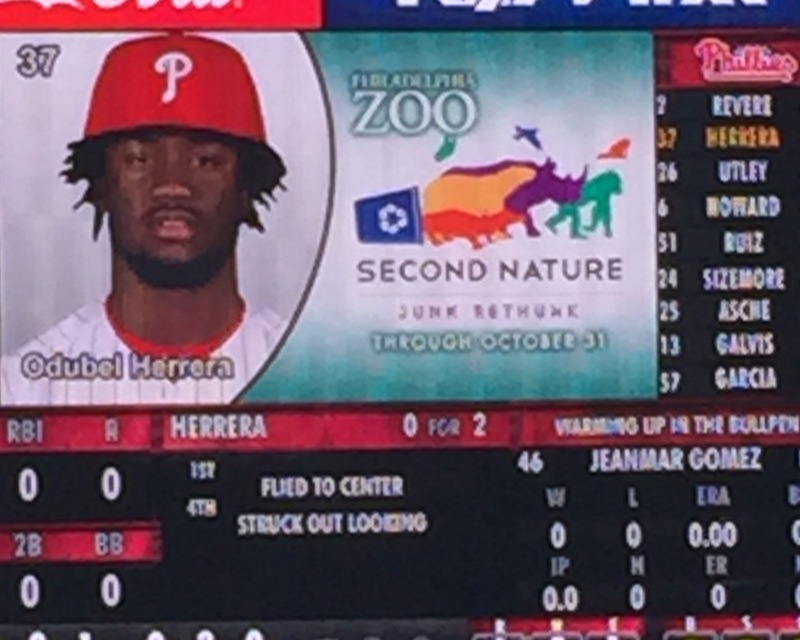 This entry was posted in Odubel Herrera, Phillie Phanatic, Steve Jeltz. Bookmark the permalink. At least the weather was beautiful and the beer was cold! Yes, it was. In fact, I think it was the nicest weather I ever experienced on an Opening Day in Philly. The only one that was nicer was Opening Day in ’98 up in Shea Stadium. Too bad they lost that one as well.